Coscarelli could possibly be one of the most creative writer-directors in Hollywood -- or maybe David Wong should take credit, but this time around, he has failed to weave his collection of genius moments into a funny, or even interesting movie. 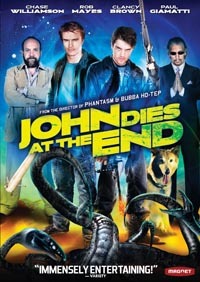 John Dies... has some of the most original bits -- I found myself intrigued and impressed throughout the film -- but ultimately Coscarelli fails at crafting a tight, interesting story. It falls flat with an almost deadpan delivery. I kept thinking that this could've been such an amazing movie had it been shaped and handled by a master storyteller. But as far as B movies go, this one is filled with awesome ideas and some decent gore.